Hibiscus Tea is a herbal shrub plant that comes from tropical Africa and is grown in many countries all over the world, including Malaysia. It belongs to the Malvacaea family. In Europe it is known as “roselle” in Latin America “jamaica” in the Middle East “karkady” “bissap” in West Africa and “red sorrel” in the Caribbean. Sabdariffa calyces are used in commercial productions of jam, jelly and sauces as well, but also as an elegant, exclusive supplement to champagne. Has a great ornamental value due to its interesting foliage. Hibiscus Sabdariffa is a short-day plant which gets its first naturally appearing flowers, when the night is longer than the day during the autumn and winter months. These flowers are the basic for the great and special fruits. The beautiful red calyces (fruits) are picked when they are still soft, before they dry out and drop their seeds for the next generation. Hibiscus Sabdariffa likes water, light and sun, and prefers a place with the option of both sun and shade. It can stand drying out, so even if it hangs a bit, it can often times freshen up again after some water. It likes to grow, and is for that reason ideal for re-potting to a bigger pot a long the way. Hibiscus sabdariffa, or sour tea, is a genus of the Malvaceae family. In Iran, it is typically known as sour tea. In English-speaking countries it is called Red Sorrel. Originally from Angola, it is now cultivated throughout tropical and subtropical regions, especially from Sudan, Egypt, Thailand, Mexico and China. The calyces of Hibiscus Sabdariffa; are prolific in many modern commercial blends of cold and hot drinks due to its pleasing taste, as well as having decorative, culinary and medicinal uses. In Egypt and the Sudan, it is used as a beverage that helps to lower the body temperature, to treat cardiac conditions, and as a diuretic. In African; folk medicine it has been used for its spasmolytic, antibacterial, cholagogic, diuretic and anthelmintic properties. Other uses in North Africa include cough and sore throat, while the leaf pulp is made into a topical application for external wounds and abscesses. In Europe; the dried calyces (the cup-like structures that are formed by the sepals) are used mostly as a tea. Hibiscus Tea is commonly used in combination with lemon balm and St John’s wort for restlessness and poor sleep onset. Historically, folk medicine has used H. sabdariffa for the treatment of high blood pressure, liver diseases and fevers. In large amounts; hibiscus tea acts as a mild laxative. In Iran, it is a traditional treatment for high blood pressure which is the focus of several studies, as is cholesterol reduction. Hibiscus has been used historically; for high blood pressure and contains several important ingredients including alkaloids, anthocyanins and quercetin. It is thought that the antioxidant and diuretic effects of Hibiscus Tea are its most important mechanisms in lowering blood pressure. The flowers of this plant are colourful, but the tea is made from the calyces (the red and dried part of the flowers). It has a sourly cranberry like flavour and is served either as a hot drink or as ice-tea. The best way to drink it is with cane sugar because of the somewhat bitter taste the tea has. It was consumed already in the ancient Nile Valley during the time of Pharos and was regarded as the royalties’ primary beverage mainly for its ability to improve health. In Africa : Hibiscus Tea has been used in many years in folk medicine for treating cancer, cardiovascular disease, fever and constipation. Natural healers have used it against high blood pressure and liver disease. In Asia : Hibiscus Tea petals flavoured with ginger are being eaten in countries like Thailand, China and Malaysia, it is believed that this will help lower cholesterol. In Egypt: Hibiscus tea is being drunk to keep cool in the hot desert climate, it works like a”refrigerant” to regulate body temperature. Besides this, it is believed that it helps to promote cardiac and nervous system health. In Sudan: Hibiscus tea is used as a ceremonial toast at weddings and family gatherings. In Iran: Hibiscus tea is drank as a traditional help against occasionally restlessness and difficulty in sleeping. In China and on Hawaii: The flower is eaten to improve digestion. 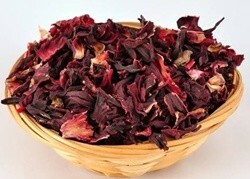 In Mexico: Hibiscus tea is used as a mild and natural diuretic. Generally: The naturally minerals which is found in the hibiscus flower have a positive effect on hair. It is believed it can prevent early hair loss, reduce dandruff and make black hair shiny. The natural oils are good in hair conditioner. Hibiscus, the safe medicinal plant, having various medically important compounds called phytochemicalsis well known for delicacy and also for its nutritional and medicinal properties. The application of the plant in managing different medical problems including cancer, inflammatory diseases, different cardiovascular problems has been well investigated by different scholars in different settings. Scientific interest in Hibiscus has grown in the last several years with a small burst of published research studies, especially in the area of dyslipidemia and hypertension. Over twenty years ago, water extracts of hibiscus flowers were reported to have a relaxation effect on the uterus and to lower the blood pressure. Studies in both animal and human models have demonstrated that extracts or infusions affect atherosclerosis mechanisms, blood sugar, lipids and blood pressure. In 2007, a clinical trial showed that Hibiscus reduced cholesterol by 8.3% to 14.4% after just one month.11 A total of 42 subjects were randomized to 3 groups for the study, conducted in Taiwan. How To Drink Hibiscus Tea To Lose Weight? Hibiscus tea and cinnamon add 2.5 tablespoons to a teaspoon. Optionally, you can add orange or lemon peel. Add boiling water to the teapot. It wait for at least 15 minutes to brew. It will work if you drink 2 glasses a day. What Are The Side Effects of Hibiscus Tea? Who Should Not Use? Consuming hibiscus tea can lower your estrogen levels. If you are using HRT (hormone replacement therapy), or are on birth control treatment of any form, you should consider skipping your hibiscus tea. A recent study conducted by Guru Jambheshwar University of Science and Technology, India, released a study on this effect of hibiscus tea. We already told you that hibiscus tea cuts estrogen levels. It also means that consuming hibiscus tea can have a direct effect on your reproductive ability. The estrogen-lowering quality of hibiscus may lead to complications if you are planning a child. There is not much research on how hibiscus tea affects the fetus. However, the best thing to do is avoid having this tea when you are pregnant or wanting to get pregnant. Although this is one of the major benefits of hibiscus tea and it helps reduce the risk of hypertension, the blood pressure lowering and diuretic properties may result in expanded blood vessels. Thus, if you suffer from low blood pressure or hypertension, and you are taking pressure-lowering medications, you must consider removing hibiscus tea from your diet. The Research concludes that hibiscus affects cancerous cells in the skin and brain. The National Cancer Institute finds that if you are undergoing radiation or chemotherapy, you should avoid having hibiscus tea, as it may cause complications when taken along with cancer medications. This is one of the major hibiscus tea side effects that you should be aware of. 1) 1 ounce hibiscus flowers. 4) 2 quarts hot water. 5) 1 to 2 cups sugar. Combine flowers, cinnamon and clove in a half-gallon pitcher. Pour hot water over the mixture, stir and let sit overnight at room temperature. The next day, strain and sweeten to taste. To serve, dilute concentrate to taste with ice and water. Add a split, 2-inch piece of vanilla bean during steeping; serve garnished with fresh mint (Senegal). Add a splash of orange blossom water; garnish with fresh mint (Egypt). Add a 1-inch knob of peeled ginger root (Jamaica). Steep plain, with no spices (Mexico). Steep with no spices; add a 3-inch piece of fresh lemongrass (Philippines).